The School runs courses and encounter days for those who share our fascination and passion for owls, falcons, hawks eagles and other raptors. 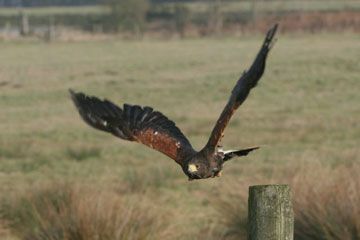 The man behind the National Falconry School is our director, zoologist James McKay, former C.E.O. of the UK’s National Federation of Zoos, and a scientific fellow of the Zoological Society of London. James has kept and flown raptors since the tender age of eleven. All of James’ staff are also competent and experienced falconers/animal handlers, and hold relevant qualifications. Vouchers - the ideal gift! If you are looking for that unusual present, why not consider a voucher for one of our activity days or courses? Decide what event you are interested in and then contact us to get your voucher. We stock and sell a wide range of equipment, books (both new and second-hand) and videos on all aspects of owls, hawks, hawking, ferrets, ferreting, falconry and dogs/dog training. All are of top quality, and all at sensible prices. 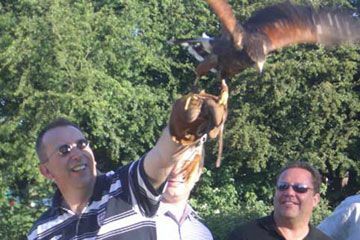 Situated in the rolling hills of the picturesque Derbyshire countryside, we run a wide range of courses and events, covering all aspects of raptors (owls and birds of prey), falconry and hawking, ferrets and ferreting, animal handling and animal photography. All courses and events are taken by James McKay, director of Honeybank, and are designed to give all participants a fun learning experience. We are happy to quote for individual needs and can build a course to cater for groups of friends or work colleagues (special group rates apply). Please contact us for further information. Gift Vouchers are available for all courses (valid 6 months). These make ideal presents. Contact us to book your course or order your voucher. 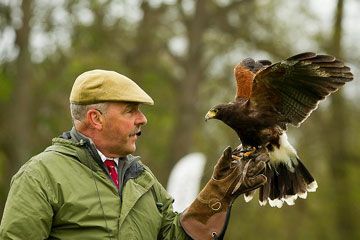 A day spent flying our spectacular birds, and learning about the colourful history of falconry and birds of prey is a never-to-be-forgotten experience. We can make this a challenging team building day, or a relaxing chill event, or can incorporate other activities to suit your requirements. We can host the event, or come to you. The choices are yours to make, and this is why so many companies use us for corporate days with a difference. Set in the beautiful Derbyshire countryside, Honeybank is home to all our animals - birds, dogs, ferrets - all of which will be there to ensure that your clients have a day to remember.